The Microsoft Surface 3 with optional Surface Pen and Type Cover. The Surface 3 is the latest tablet–that–can–replace–your–laptop from Microsoft. It’s the baby brother of the Surface Pro 3, and the first non–Pro Surface to run full Windows 8.1 rather than the RT variant that powered previous generations. This is because the Surface 3 features a quad–core Intel Atom x7 processor running at 1.6GHz, rather than an ARM–based SoC (System on a Chip) as employed in the Surface RT and Surface 2, and other tablets like the iPad. With its modern aesthetics, the Surface 3 is every bit as attractive and well–built as the Surface Pro 3, and its smaller size (267 x 187 x 8.7mm versus 292.1 x 201.4 x 9.1mm) and lighter weight (622 versus 800 grams) might actually make it more appealing to some prospective users. Given the size of the Surface 3, the display obviously doesn’t offer the Pro 3’s 12-inch dimensions and 2160 x 1440 resolution. But the Surface 3’s 10.8–inch, 1920 x 1280 display still looks pretty decent, and, since both third–generation Surfaces have the same 3:2 aspect ratio, apps look nearly identical on both tablets. The only significant change design–wise is that the Surface 3’s kickstand offers three fixed positions, rather than the fantastic multi–position kickstand featured on the Surface Pro 3. This is a shame, but is apparently due to Microsoft trying to keep the cost down. Something else the Surface 3 lacks, though, is rather more welcome: there’s no fan. Considering the Surface 3 purely as a tablet, its hardware stacks up pretty well against the iPad Air 2. Both entry–level models are priced at £419$499 (the iPad Air 2 starts at £399$499) and feature 2GB of memory; but where the iPad Air 2 offers just 16GB of storage, the Surface 3 has 64GB. Now admittedly, the full Windows operating system takes up a hefty chunk of this (far more than iOS), but you’re still left with 36.7GB for your own apps and data. And should that later prove not to be enough, Surface 3 features a Micro SD card reader behind the kickstand, enabling you to expand the storage of the device. There’s also a full–size USB 3 port and a Mini Display Port, and since the device is charged via a Micro USB port, this can also be used as a standard USB port as well. In terms of raw performance, the Surface 3 achieved a 64–bit multi–core score of 3412 in Geekbench 3, which surprised me in being quite a bit less than the iPad Air 2’s more impressive 4418. (My i5–based Surface Pro 3, by comparison, scored 5645.) However, in use, the Surface 3 felt relatively snappy, whether running modern apps or older desktop applications. Until recently, the biggest down side to Windows–based tablets was that the available music apps were lacking. However, the Surface now has a killer music app in the form of StaffPad (reviewed in the June issue of SOS), which runs fine on the Surface 3. Indeed, one of the improvements listed in a recent update was indeed “performance enhancements for Surface 3”. But in order to use the app you’ll need to purchase a Surface Pen (£44.99$49), which is more or less required to get the most out of the device. I understand Microsoft are trying to hit a specific price, but omitting such an essential accessory is a bit annoying, especially when all other ink–capable Surfaces have included pens as standard. Besides StaffPad there’s also FL Studio Groove, which seems more sophisticated than FL Studio Mobile (the company’s mobile offering for iOS and Android), Recording Studio Pro, which seems like a poor man’s GarageBand, a few dodgy instrument apps, and, um, that’s about it. It’s a real shame that music and audio developers haven’t embraced Windows tablets in the same way they have iPads, but it’s perhaps inevitable given Apple’s tablet market share, and also the fact that Apple have been better at giving developers suitable technologies with which to develop feature–rich music and audio apps. The Surface 3 isn’t just designed to run tablet–oriented apps, however: you can also run standard desktop Windows programs as well, such as Sibelius, Live, Cubase, Reaper and so on. As with all Surfaces, Microsoft sell a Type Cover designed for the Surface 3, and this can also be considered a required accessory if you want to use a Surface as a laptop. The third generation of Type Covers are the best they’ve ever been, and while certainly not providing the best keyboard or trackpad you will ever use, to put it kindly, they are at least usable. The Surface 3 Type Cover is available in a variety of colours from Microsoft for £102.99129.99. Since I was writing this review at the same time I was reviewing the latest version of Sibelius, I tried installing it on the Surface 3 as well as my Pro 3. The entry–level Surface 3 easily meets Avid’s minimum requirements — 64–bit Windows with at least 1GB of memory and 1GB free hard disk space — so the program ran remarkably well. With the Orchestral demonstration song loaded, I was using 1.3GB of memory and was able to play the score back with the basic sound set. One of the new features in Sibelius is the ability to make use of the Pro 3’s pen for manipulating notes and annotating scores, and this functionality works just the same on the Surface 3 (assuming you buy a pen). If you’re planning on purchasing a Surface to run Sibelius (or even StaffPad), I’d recommend skipping the entry–level model and opting for the more expensive one that offers both double the memory and storage — 4GB and 128GB respectively — for £499$599. I really like the Surface 3: the form factor feels great in your hands, and the fact you’re holding a device that’s small, light, silent, and able to run a full copy of Windows is kind of incredible. The Surface 3 and, of course, the Surface Pro 3 are arguably the best tablets for those working with notation; but, aside from that niche, it would be hard to recommend the Surface 3 for other music and audio related tasks. For one thing, while the Surface 3 is just about powerful enough to run Sibelius, it would begin to struggle with more audio–intensive programs. If you want to run those on a Surface (or need more power in general), you’d be better off purchasing the Surface Pro 3. 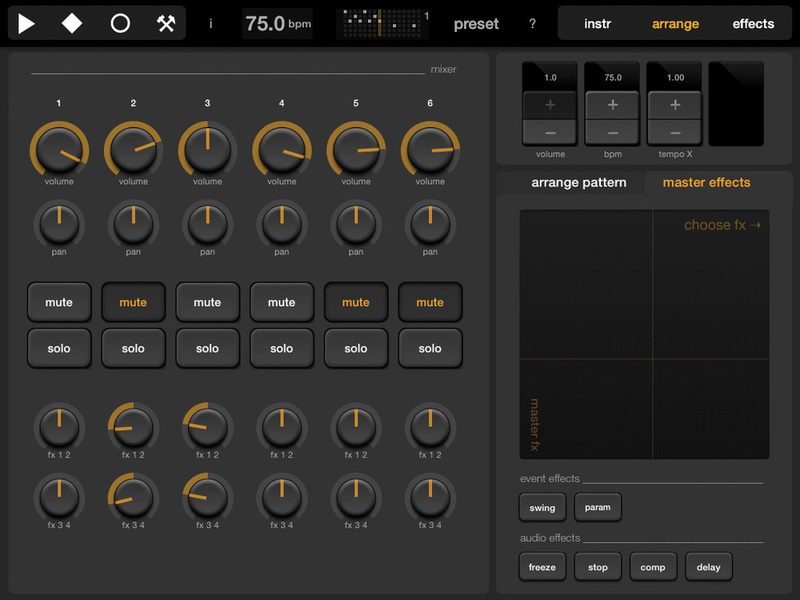 Elastic Drums is a 16–step sequencer and drum/percussion synthesizer with six audio channels and four effects, plus some automatable effect–modulation controls that make good use of touch–screen technology. It is the brain child of Oliver Greschke, in collaboration with German IDM duo Mouse On Mars. Oliver’s intention was to create a tool that was easy to use and fun, and his work was inspired by Korg’s Electribe and the various Machine products from Elektron. MOM Instruments warn that the app is CPU-hungry, and the effects will switch off to maximise resources on iPhone 4 and iPad 1 devices. I used an ageing iPad 2 and iOS 8.3 for the review and had no such problems, although I ran into one or two minor bugs. Elastic Drums’ Sequencer page, where the sound editing and sequencing of drum parts takes places.At the top of the app is a menu bar which remains the same no matter which page is being viewed, thereby making it easy to access the main functions at all times. On left of the bar there are the transport and record buttons, and an audio and MIDI settings page where thing like the audio buffer size and MIDI sync setting are decided. Next along the menu bar are tempo and pattern counters, the values of which can be changed with a finger sweep. In the middle is a button that brings up a long list of arrangement presets, and on the right there are three buttons which call up the main windows/pages. Instr is the first of the three windows, and also the first that the user sees when the app is opened. It’s here where the individual patterns are created and edited via a step sequencing method that’s been used on hardware products from the likes of Roland and Zoom for donkey’s years. Notes and beats appear as orange blocks on a grid, and can be removed or added with a simple tap of the finger. The grid shows all six audio channels, and when one is selected, the sound it is playing is shown underneath, along with its own set of parameter controls. Any of the six sounds can be swapped for another, and to make it easy for the user to find the combination they’re looking for, the menu options are split into 10 instrument types (Kick, Snare, Hi–hat, Clap, Square, FM, FM4op, Wobble, Grain and Tom). Arranging the patterns into a song happens on the page called Arrange, where there are 20 pattern slots. Patterns can be copied from one slot to another and then modified (which is a pretty fast way to build a song), or made the hard way by picking a vacant pattern slot and programming it from scratch. Elastic Drums’ Arrange page, which is also where we find the instrument’s mixer.Taking up most of the page is the mixer through which the six channels are balanced. Each channel has volume, pan and effects send knobs, plus mute and solo buttons. It would perhaps make more sense to have the channel mixer controls on the Instr page, but Oliver has had to fit things where he could find space. Touchscreen technology is used most effectively on the Effects page, which has an X–Y matrix for modulating parameters of the 11 mono and nine stereo effects. The movement of a finger on the pane is automatically recorded when a pattern or sequence is playing, and each effect can be modulated separately. Given that you can automate knob adjustments, some pretty radical audio manipulation is possible. Additionally, the stereo mix bus passes through a group of well–chosen ‘master’ effects and processors (Freeze, Stop, Comp, Delay, Swing and Param), but their X–Y panel is back on the Arrange page. Overall, Elastic Drums is a curious mix of old step-sequencer features and newer, touchscreen–controlled sound-manipulation tools. It reminds me of Pulse Code’s Rhythm Studio app, which emulates a bunch of old sequencers and combines them with an X–Y controller, but Oliver has definitely found his own way of doing things, and has created an instrument with its own distinct character. Most of the functions are fairly intuitive, and nothing is further than a button tap from the screen. Consequently the app is pretty easy to use, although the X–Y controllers offer so many possibilities that time is needed to explore them fully. Audiobus and Inter–App Audio support means that Elastic Drums can be used with other apps, and it’s possible to record a performance (as a WAV) and export it to Soundcloud, Audioshare or simply to email it to someone. 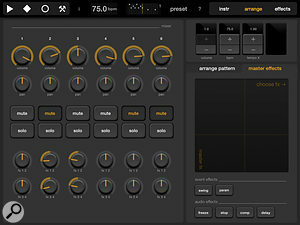 Rhythm is a multi–sample playback interface with an eight–step sequencer and five–channel mixer. It is the brainchild of games developer Gil Carmel, who enlisted the help of interactive designer Christopher Paniati and composer Ted Masur in his quest to create a playful and easy–to–use app that would have some educational value. 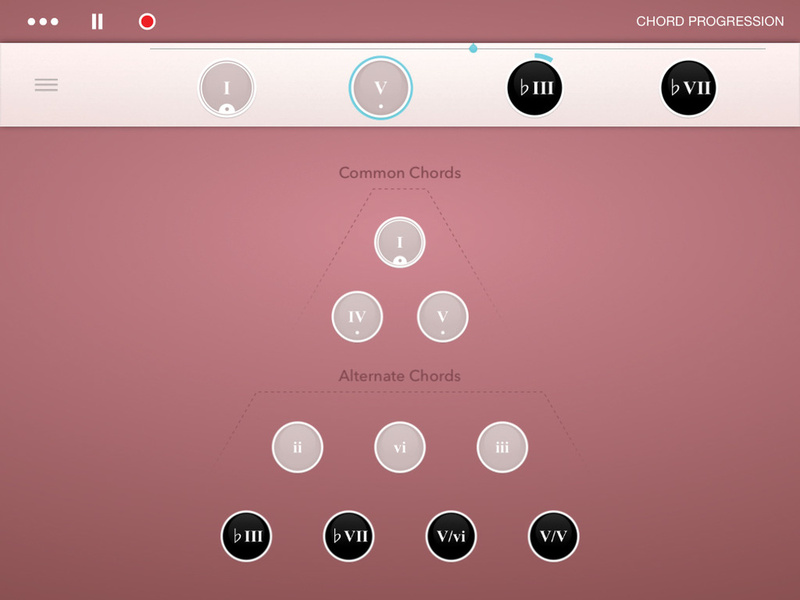 Rhythm’s Chord page is the starting point for a new composition.When it is first opened, the app guides the user through a tutorial which helps them build a composition, one step at a time. 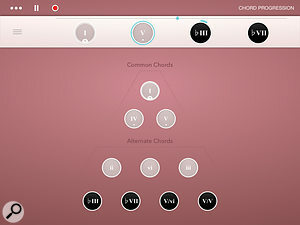 The app starts by providing three related piano chords that can be dropped into four sequencer slots in any order. The four slots, known as measures, can be expanded to eight from a little drop–down control panel, which also has a tempo slider running from 65 to 200 bpm, a key selector (with all 12 chromatic key options) and major/minor selector. Any of the above parameters can be changed during play or when recording a performance, and the app handles the changes pretty seamlessly, although sometimes the loops take a while to kick back in, depending on the sequence that’s loaded at that moment. Alongside the three main chords is a panel of seven alternative chords, all of which are musically related, and these dynamically alter if the key is changed from major to minor, or vice versa. Once again, the user can drag and drop the chords into any location they choose. Once a pleasing sequence is in place, the user is ready to move to a display which looks a little bit like a basic DAW tracking page. Here the app displays five instrument channels, each with its own level fader. Each channel is restricted to one type of instrument, so there is piano on channel one, bass on two, guitar on three, percussion on four and drums on five. A fixed menu of loops is available to each channel, and the user is encouraged to swipe through them until they find some that appeal. In all, there are 56 pianos, 34 basses, a mix of strummed and picked guitar patterns, 45 percussion options, and a combination of 15 brushed and 30 stick loops in the drum channel. Rhythm’s Sequence page gives you a simple overview of your composition.Tin Pan have certainly recorded some really nice samples, focusing on acoustic sounds rather than anything too electronic, distorted or effects–laden. There is no way of EQing the audio or manipulating it with processors within the app, but the material has been so carefully arranged and played that it doesn’t need any interference for it to sound coherent and well balanced. Although the mixer options are extremely basic, the user is given quite a lot of control over the pitch of each measure/loop. For example, it is possible to group all the measures in a channel and shift them up or down within the octave, or de–group them and adjust their pitches independently. Performances are recorded simply by tapping a Record button at the top of the page, and the resulting file can then be emailed, opened in another compatible app, exported by AudioCopy or shared on Soundcloud. The resulting file is an MP4a rather than a WAV, which is probably an issue Tin Pan should address if they want the app to appeal to the home recording market. In its current state, the app is quite restrictive compared to music software aimed at composers and producers. The sequencer is extremely limited, there’s no facility for importing custom loops, the mixer lacks EQ, pan controls, mute and solo buttons (muting and soloing has to be done by moving the channel level faders), and there are no effects to send anything to.